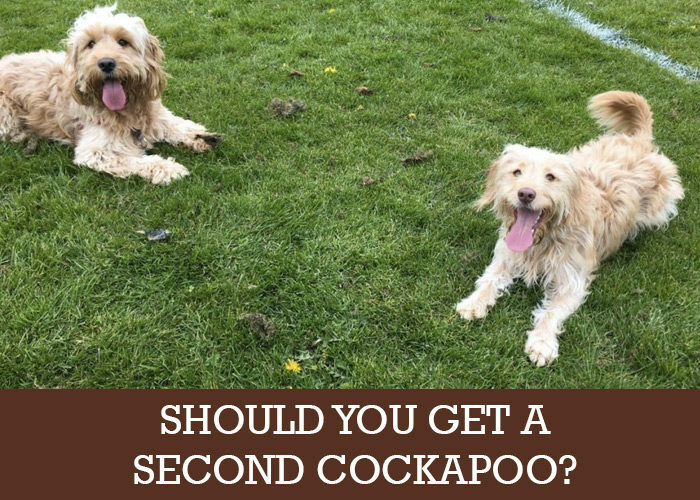 Blog > Facts and Fun > Five Signs You’re Ready to Get Another Cockapoo! Five Signs You’re Ready to Get Another Cockapoo! You find yourself strangely drawn to cockapoo adverts again, you look at your dog and wonder if he is lonely, and you glance enviously at two cockapoo families at the park. But are you really ready for a second dog? We look at some signs and some things to consider to see if you are ready for that big commitment. Perhaps the first thing to think about is, can you afford another cockapoo? Not just the initial cost, but the ongoing costs? Vet insurance, dog food, doggy day-care if you use it? Another dog bed, another set of bowls, harness, lead and collar? Although getting a second dog is in some ways easier than getting the first one, since much of the adjustment work is done, there will still be an extra economic burden. In the UK you need to have your cockapoo restrained in the car, so you might need a bigger car since each dog will need a car seatbelt each. So, you have done the maths and figured out that you can afford another dog. Perhaps you always planned to have more than one, but wanted to adjust to the changes separately – that was a good plan. Next thing to do is talk to your family, human beings, that is. Make sure that they understand a new dog will be a commitment, that they will need to be involved, and they need to be happy with the decision. Talk to everyone who is involved with the care of your cockapoo, if your mother-in-law doggy sits from time to time, then make sure you talk to her, too. Check and make sure everyone is on board, is happy with the decision, and will help out with the new dog. How do you feel about your first dog? You love him, sure, but do you want to do other things too? Do you cheerfully put him in kennels and travel here and there without him? Is he just an addition to your life or is he a huge part of it? Only you can answer these questions, but if your cockapoo is just an accessory to your life and not just a big part of it, then perhaps you shouldn’t get another one. Dogs like to be part of the pack, so you need to allow him to be part of your life 95% of the time. We all know you can’t take your dog shopping, or to the dentists or doctors with you, but on your downtime, does it always involve the dog? If you have missed parties and drinks with workmates to spend time with your dog; when it’s time for holidays then you look for dog-friendly bed and breakfast places, then it might be time to get another dog. Your life should revolve around your dog to a large degree – that’s how you know you are going to make a good dog parent for another cockapoo. What about human babies? If you or your partner is expecting a baby, then don’t get another dog. Human babies need one on one attention, and your new dog will suffer from a lack of attention. Of course, your own flesh and blood is definitely going to get the most attention, as they should! But that leads to you, tired from the new baby, getting irritated with the new cockapoo when he or she doesn’t pick up on the house rules right away. It’s just not fair. Do you have time for another dog? Your new cockapoo will need lots of time. It’s easy to forget how much time and effort you put into your first dog, but you spent a whole host of time training him, teaching him, setting the rules of your home and reinforcing them with him kindly and firmly. If you have a promotion pending that is going to keep you at work longer hours, or you feel your relationship is on rocky ground and you aren’t quite sure what is going to happen, then these aren’t times to get another dog. It isn’t fair to get a cockapoo when you aren’t confident that you will be living in the same place in a year. Which brings me to another consideration…. If you rent your home, are you permitted to have dogs? Some landlords have a no pet policy on the tenancy agreement, but will allow you to have a dog if they are kept under control and you take care of the house and garden. But they might not be happy with you having two dogs. Also, some councils only allow you to have two dogs per home. Some councils only let you have one! Just check with your landlord that it’s okay to bring another cockapoo into the home. Of course, if you own your own home, then you don’t have the same concerns, but if you are in a detached or even semi-detached home and you think your new dog might cry at night before they settle then it might be a good idea to have a chat with the neighbours about your new pooch. What do you think your dog would like? Dogs are pack animals and usually love other dogs, providing they are both well socialised. Does your cockapoo always want to play with other dogs at the park? Do they always wag their tail at other dogs when you are out for a walk? If your dog is happy and content, and well trained, then it’s going to be a good idea to get another dog. Dogs are happiest with other dogs. Having had one dog and then two dogs, and seeing the wonderful bond the two dogs have, seeing them playing together and sleeping together, there is nothing like a second little fur-baby to enhance you and your cockapoo’s life. Of course, it needn’t be another cockapoo. You could take a look at the local dog trust or dog rescue place for a dog needing a home. But we love cockapoos the best! Happy Cockapoo? 8 ways your dog’s body language will let you know life is good. The cutest cockapoo videos youtube has to offer! Just how popular are cockapoos?